Manage product quantity with Product Quantity for WooCommerce plugin, beautifully. This plugin is a premium version of free "Product Quantity for WooCommerce" plugin. Product Quantity for WooCommerce plugin lets you manage product quantities for order (i.e. cart) in WooCommerce. Cart total quantity – will check minimum and/or maximum quantity for all products in cart (i.e. sum of all quantities). Per item quantity – will check minimum and/or maximum quantity for each product in cart. This value is applied to all products (i.e. same minimum and/or maximum quantity for each item). Per item quantity on per product basis – similar to “Per item quantity”, but lets you set different minimum and/or maximum quantity for every product. Works with variable products (i.e. different quantities can be set for each variation). Additionally you can control quantity step – for all products or on per product basis. adding product quantity info on single product and/or archive pages. Plugin settings are located in “WooCommerce > Settings > Product Quantity”. Enabled/disables the plugin. May help if you want to configure plugin’s settings, before applying it on frontend. Save settings after enabling this option, so you could enter decimal quantities in step, min and/or max quantity options. Possible values: Do not force; Force to min quantity; Force to max quantity. Will force all minimum quantities to 1. This includes cart items, grouped products etc. Ignored if “Minimum quantity” section is enabled. Possible values: Do not validate; Validate and add notices; Validate and auto-correct quantities. Enables/disables customer notices on the cart page. Stops customer from reaching the checkout page on wrong quantities. Customer will be redirected to the cart page. Possible values: Do nothing; Reset to min quantity; Reset to max quantity. Ignored if empty. E.g. 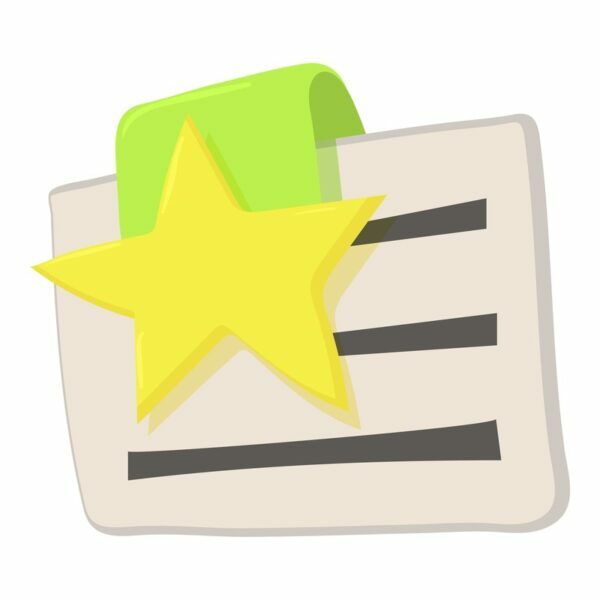 : width: 100px !important; max-width: 100px !important;. Will replace standard WooCommerce quantity number input with dropdown. Please note that maximum quantity value must be set for the product (either via “Maximum Quantity” section or e.g. by setting maximum available product stock quantity). Also please note that currently quantity as dropdown will be disabled for variable products and it will ignore exact (i.e. fixed) quantity section settings. Adds quantity info on single product page. You can use HTML and/or shortcodes here. Available shortcodes: [alg_wc_pq_min_product_qty], [alg_wc_pq_max_product_qty], [alg_wc_pq_product_qty_step]. Adds quantity info on archives. Resets section's settings to the default values. Enables/disables minimum quantity for products. This will set minimum total cart quantity. Set to zero to disable. Message to be displayed to customer when minimum cart total quantity is not reached. Replaced values: %min_cart_total_quantity%, %cart_total_quantity%. Minimum allowed order quantity is %min_cart_total_quantity%. Your current order quantity is %cart_total_quantity%. This will set minimum per item quantity (for all products). Set to zero to disable. This will add “Product Quantity” meta box to each product’s edit page. Message to be displayed to customer when minimum per item quantity is not reached. Replaced values: %product_title%, %min_per_item_quantity%, %item_quantity%. Minimum allowed quantity for %product_title% is %min_per_item_quantity%. Your current item quantity is %item_quantity%. Enables/disables maximum quantity for products. This will set maximum total cart quantity. Set to zero to disable. Message to be displayed to customer when maximum cart total quantity is exceeded. Replaced values: %max_cart_total_quantity%, %cart_total_quantity%. Maximum allowed order quantity is %max_cart_total_quantity%. Your current order quantity is %cart_total_quantity%. This will set maximum per item quantity (for all products). Set to zero to disable. Message to be displayed to customer when maximum per item quantity is exceeded. Replaced values: %product_title%, %max_per_item_quantity%, %item_quantity%. Maximum allowed quantity for %product_title% is %max_per_item_quantity%. Your current item quantity is %item_quantity%. Enables/disables quantity step for products. This will set quantity step for all products. Set to zero to disable. Message to be displayed to customer when quantity step is incorrect. 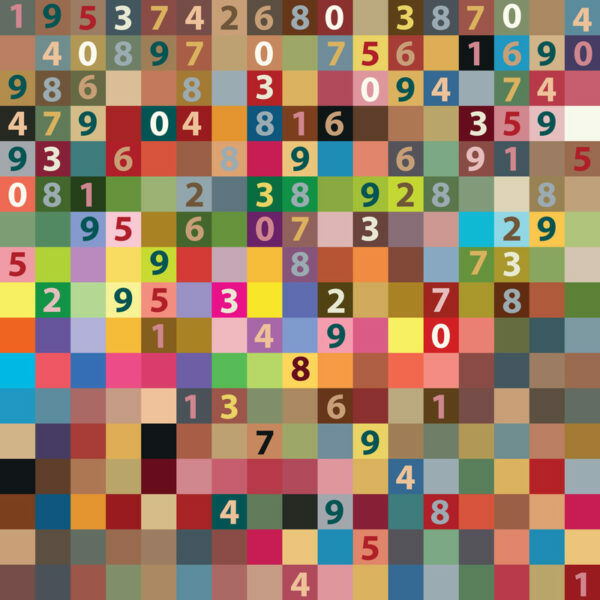 Replaced values: %product_title%, %quantity_step%, %quantity%. Quantity step for %product_title% is %quantity_step%. Your current quantity is %quantity%. Allowed quantities as comma separated list, e.g. : 3,7,9. Ignored if empty. This will add meta box to each product’s edit page. Message to be displayed to customer on wrong allowed quantities. Replaced values: %product_title%, %allowed_quantity%, %quantity%. Allowed quantity for %product_title% is %allowed_quantity%. Your current quantity is %quantity%. Disallowed quantities as comma separated list, e.g. : 3,7,9. Ignored if empty. Message to be displayed to customer on wrong disallowed quantities. Replaced values: %product_title%, %disallowed_quantity%, %quantity%. Disallowed quantity for %product_title% is %disallowed_quantity%. Your current quantity is %quantity%. Excellent, easy to set up and use, just perfect! 43 thoughts on "Product Quantity for WooCommerce"
I can’t configure a quantity like 0.96 on the steps, why? If anyone else has similar question – “Decimal quantities” option was added in plugin version 1.3.0. Can this plug allow you to customize the quantities of a product that a customer can add to their cart? For example, I want a customer to be able to add 1, 2, or 4 of an item, but not 3. Unfortunately I don’t think it’s possible at the moment. You could set minimum quantity to 2, step to 2 and maximum quantity to 4, but that would make quantity of 1 invalid. I could try to add this to the plugin, but I’m not sure how would admin set allowed quantities… I mean would listing all valid quantities as comma separated text (I mean by admin) would be good enough, e.g. : 1,2,4? And do you need this on per product basis (i.e. different for each product) or these quantities would be applied to all your shop’s products? We’ve just released new plugin version 1.5.0. 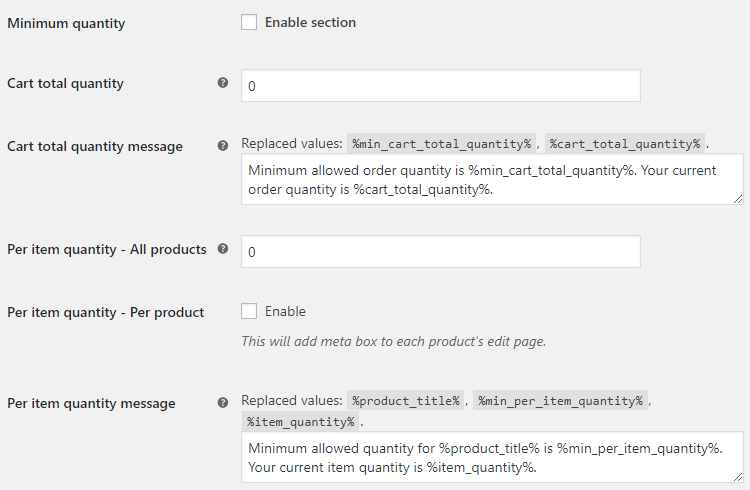 After you update, you will find new “Exact Quantity” options section (in “WooCommerce > Settings > Product Quantity”). This should do exactly what you’ve described, i.e. set allowed or disallowed quantities as a comma-separated list, e.g. 3,7,11. Hello…this plugin is working great for what I need it to do on my website…the cart totals are correct and are allowing customers to buy in steps of .5 units….however when you click the Proceed To PayPal button after confirming your cart total is correct…the information being fed to PayPal does NOT include the cost for those incremental units. So while the shopping cart shows 1.5 units in cart and the math is correct on the cart for what they owe…..when they hit the Proceed to PayPal button the information funneling to PayPal is as though there was only 1 unit in the cart. Is there a way to correct this? Thanks so much! Unfortunatelly this plugin is not compatible with the Flatsome theme. When I set decimal quantities 0,1 and I try it out, it will produce 1,100001 –> 1,200002 –> 1,300003 etc..
Will be checking that asap. One question though – do you have any of Force JS check options enabled in plugin’s “Advanced Options” settings section (i.e. at the bottom of the page in “WooCommerce > Settings > Product Quantity”)? 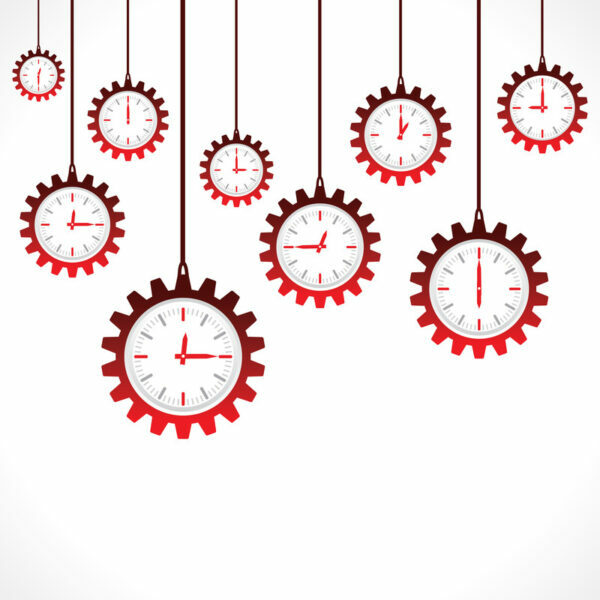 If you have – please try temporary disabling them to see if issue is still there. Ideally if we could bring back standard HTML number input spinners it would be working fine, however I didn’t manage to do it – will be trying further – unfortunately I’m not a big expert in CSS. Hi, we also use Flatsome. At which moment this issue pops up? I havn’t noticed it yet. Even when I use plus and minus to alter quantity everything works fine for me. Can I use this plugin in variable products ? Yes, plugin is compatible with variable products. I.e. you can set all options (minimum quantity, maximum quantity, quantity step) for each variation separately. Is only available in the full version. I am not going to be able to try it. Unfortunately yes – as all “per product” options are available in Pro only, you won’t be able to test it in free version. However – as there is “30 days no questions asked” refund policy on WPFactory, we will issue a refund if something is not working as expected (or alternatively I could try to fix it if you’d wish). Is not possible to get a 30 day trial version ? I installed the plug in an I noticed that the minimum quantity doesn’t refresh when you change the variation product from a higher quantity to a variation with a lower quantity. You can try in the product I am testing the plug in. Could you please try enabling “Force JS check” checkboxes in plugin settings (“Advanced Options” subsection at the bottom of settings page). I have them checked and is not refreshing. Hi, did you find out what could be the problem ? Sorry for not replying earlier. Yes, I can see the problem – already fixing this and I’m almost finished. Will get back to you as soon as possible. We’ve just released new plugin version 1.5.0. After you update, please go to plugin settings (in “WooCommerce > Settings > Product Quantity”) and there in “General Options” section you will find new “On variation change (variable products)” option. Please set that to “Reset to min quantity”. Please let me know if it’s not working as expected. Hello! I think about buy PRO version. Can you tell me whether in the extended version I can set the minimum order quantity for a specific category, but not for individual products? It’s very important for me. Unfortunately this is not possible at the moment, however, this seems like a useful feature – will be adding it in next update. Extending Karolinas idea of a per-category-basis I’d also suggest to have both “per item” and “per item and per product” run parallel where “per item” sets the standard quantity multiplier and “per item and per product” the product specific exceptions. Instead of editing each single product on changes in my quantity policy, I could then adapt most of the products’ quantities on a “per item” basis in one step and only care about exceptions on a per product quantity editing step. “Per item and per product” might be triggered when the meta box is not left empty or not zero (or both). Does this plugin allow you to set the quantity label on a per product basis? I need Quantity to say “Number of Children” but only on 3 or 4 products. i just install the plugin . and i cannot find where i can force display of minimum quantity in the archive and on the single product page. its still show “1” as default even id the minimum is 0.5. Sorry for a late reply. I’ve just checked and you are correct – for some reason it’s not forcing to a minimum quantity below 1. I’ve just tried setting minimum quantity to 1.5 and it’s working properly, but when I set it to 0.5 it’s not… Will be checking that asap. 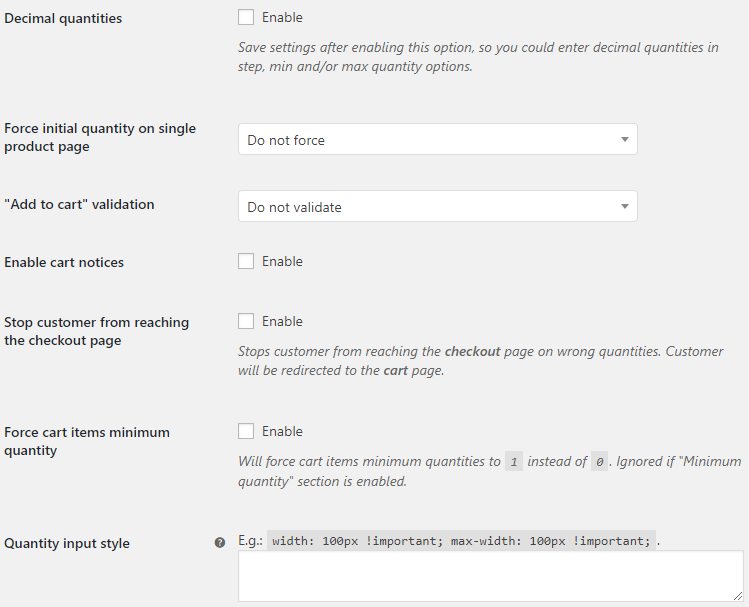 After some testing I’ve figured out that setting “Force initial quantity on single product page” option to “Force to min quantity” in plugin’s “General Options” (in “WooCommerce > Settings > Product Quantity”) seems to be solving the issue. Please let me know if there are still any problems. yes its look like its working but only on product single page, not on shop page. Sorry for a late reply. Already fixed that in our development version, so it will be fixed in the next plugin release. As promised, we’ve just released new plugin version 1.6.0. After the update, you will find new “Force initial quantity on archives” option in plugin’s settings. Please let me know if it’s not working as expected. i installed the last version on my site and still no change, its only working on product page. That’s strange… I have just rechecked it on my server and it seems to be working fine (with 0.5 set as minimum quantity for all products). Are you sure you are setting the new “Force initial quantity on archives” option to “Force to min quantity” (and not the old one “Force initial quantity on single product page” instead)? I’ve also tried opening the link to your site but got “The connection has timed out” error. Also if you wish you can create/share an admin account to your site, so I could log in and check what’s going on. My private email is [email protected]. im sending you a login info to the domain. but before that, did you check on your end if ist work when you set products individually? and not global. I’ve just tested and unfortunately it’s still the same – even if I set minimum quantity on per product basis (i.e. individually) – “Force initial quantity on archives > Force to min quantity” option seems to be working fine on my server. P.S. Not sure if you have already sent me the login details, but I haven’t received it. i have this plugin combined with a plugin for creating product bundles. Whenever i set a minimum quantity for a single products, this quantity is also applied on the products included in a bundle, which shouldn’t be the case. Is there a solution to this, so the minium quantity only applies to the products being bought seperately? I’m using this plugin and it’s perfect, but now I have a problem. For example, if I set the minimum quantity as 3, then I add a product, when I activate the option Inventory/Sold individually, so it will conflict with the minimum quantity. How to solve this problem? Thank you. Very thanks for your reply quickly. As you said, I have many products. I’m looking forward to the next update version. Anyway, thanks for your doing everything. * Fix - Variable products - Reset step on variation change fixed. * Dev - "Quantity Info" options added. * Dev - "Quantity Dropdown" options added. * Dev - General Options - "Force initial quantity on archives" option added. * Dev - "Exact Quantity" renamed to "Exact (i.e. Fixed) Quantity". * Dev - Settings split into sections ("General", "Minimum Quantity", "Maximum Quantity", "Quantity Step", "Fixed Quantity"). * Fix - Stop customer from reaching the checkout page - "WC_Cart::get_cart_url is deprecated..." message fixed. * Dev - "Exact Quantity" section added. * Dev - General Options - "On variation change (variable products)" option added. * Dev - Code refactoring (alg-wc-pq-variable.js etc.). * Fix - Step check - Min quantity default value changed to 0 (was 1). * Fix - Admin settings - Per product meta boxes - Step option fixed; checking if max/min sections are enabled. * Fix - Force minimum quantity - Description fixed. * Dev - "Force JS check" options enabled for decimal quantities. * Dev - "Add to cart validation" option added. * Dev - "Quantity step message" option added. * Dev - "Force cart items minimum quantity" option added. * Dev - Force JS check - Quantity step - Now value is changed to nearest correct value (instead of always higher correct value). * Dev - "Decimal quantities" option added. * Dev - "Force initial quantity on single product page" option added. * Dev - "Quantity input style" option added. * Dev - Minor admin settings restyling. * Dev - Min/max "Per item quantity" (for all products) moved to free version. * Fix - Cart min/max quantities fixed. 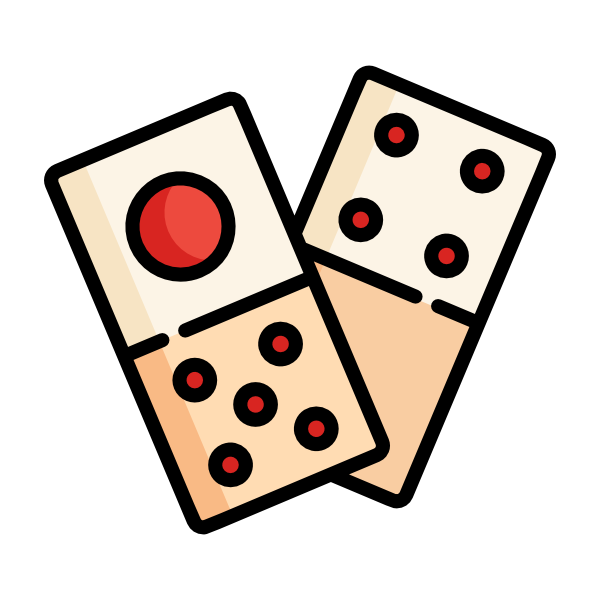 * Dev - Advanced Options - "Force JS check" options added. * Dev - Raw input is now allowed in all "Message" admin options. * Fix - Core - Checking if max/min section is enabled, when calculating product's max/min quantity. 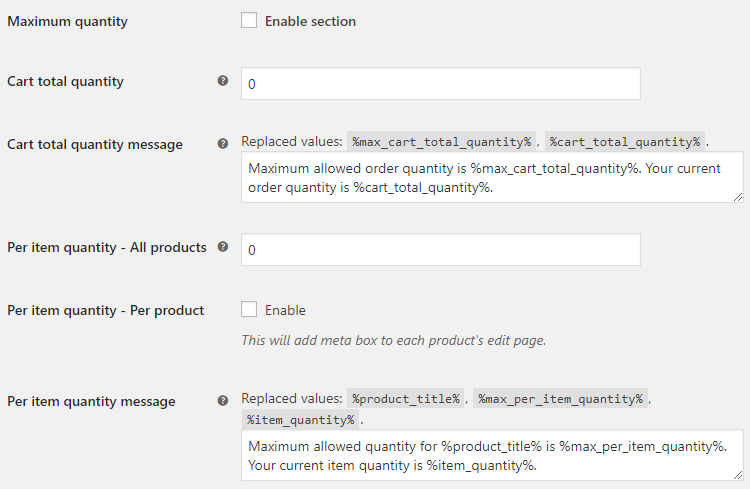 * Fix - Admin settings - Per product meta boxes - Checking if max/min section is enabled (not only "Per item quantity on per product basis" checkbox). * Fix - Core - Maximum order quantity - Upper limit bug fixed (when get_max_purchase_quantity() equals -1). * Dev - Core - Minimum order quantity - Upper limit (get_max_purchase_quantity()) added. * Dev - "Quantity Step" section added. Products per Page for WooCommerce$9.99 Sale!